This article is about the faction. For other uses, see Dawnguard (disambiguation). The Dawnguard is an order of vampire hunters living and operating from Fort Dawnguard. You may join them to fight against Lord Harkon and his plot to blot out the sun. The Dawnguard was re-formed by Isran in order to combat the growing vampire menace in Skyrim, and initially only consists of him, Celann, and Durak when you arrive. As time passes (regardless of which faction you join), more people join the Dawnguard. The Dawnguard also keeps two armored huskies as war dogs, three armored trolls (tamed by Gunmar), and partially shelters several refugees who fled there for relief from the vampire scourge. However, the latter are not permitted to enter the fort itself. To join the Dawnguard, you must speak with Isran at Fort Dawnguard. You can learn how to reach the fort by hearing about the vampire hunters as part of the Dawnguard quest. Once there, Isran will ask you to investigate Dimhollow Crypt in the next quest, Awakening. After completing Awakening, you will become a member of the Dawnguard in the quest Bloodline by rejecting Lord Harkon's offer to become a Vampire Lord. These benefits should be compared to those offered by the Volkihar. Master-level trainers in Archery (Sorine Jurard), Heavy Armor (Isran), Restoration (Florentius Baenius), and Smithing (Gunmar). Access to an apothecary (Florentius Baenus), blacksmith (Gunmar), and general goods merchant (Sorine Jurard). Access to an arcane enchanter and alchemy lab. Access to Gunmar's Forge, where more powerful crossbows and bolts can be forged. Can acquire the powerful Dawnguard Rune Axe, Hammer, and Shield. Only way to puchase Restoration spells with the rare sun damage effect. Multiple possible followers as well as Bran and Sceolang, two huskies. Celann, Durak, and Ingjard make up the majority of followers without a level cap. Random encounters where vampires attack the player or settlements are less likely to occur after completing the Dawnguard questline. If you have vampirism but rejected Harkon's offer, members of the Dawnguard will not offer their services to you and will have very limited dialogue until you are cured. Most members of the Dawguard will suggest you speak with Falion in Morthal, but there is another option. If you become a member of the Volkihar Vampire Clan by accepting Harkon's offer, you will be labeled an enemy of the Dawnguard. 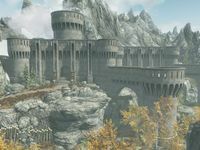 You will not be able to use any of the Dawnguard's services and will be attacked on sight by members even if you choose to cure your vampirism. This can be remedied somewhat by destroying the Dawnguard. The primary Dawnguard questline consists of twelve required quests and one optional quest. Three achievements (80 points; 2 Bronze and 1 Silver) are unlocked by Dawnguard quests. (optional) Bolstering the Ranks: Find Florentius Baenius and recruit him into the Dawnguard. A Jarl's Justice: Kill a vampire masquerading as a Visiting Advisor. Rescue: Rescue a victim from vampires. This page was last modified on 23 August 2018, at 10:39.